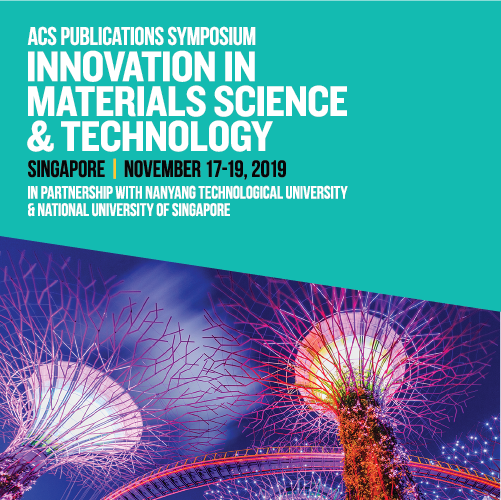 ACS Publications will host its symposium on “Innovation in Materials Science & Technology” in partnership with Nanyang Technological University and National University of Singapore in Singapore from November 17-19, 2019. The three-day scientific program will feature five plenary sessions on important topics influencing the fields of materials science and technology. Attendees have the opportunity to share their science during poster sessions and network with their peers and world-renowned scientists and lecturers. The symposium’s Organizing Committee includes Prof. Harry A. Atwater, Editor-in-Chief, ACS Photonics and Howard Hughes Professor of Applied Physics and Materials Science, California Institute of Technology, Prof. Xiaodong Chen, Director, Innovative Centre for Flexible Devices (iFlex), Nanyang Technological University, Prof. Bin Liu, Deputy Editor, ACS Materials Letters and Provost’s Chair Professor, Department of Chemical and Biomolecular Engineering, National University of Singapore, Prof. Xing Yi Ling, Associate Professor, Nanyang Technological University, Prof. Kirk Schanze, Editor-in-Chief, ACS Applied Materials & Interfaces, Dr. Sarah Tegen, ACS Publications, Dr. Laura Fernandez, ACS Publications and Dr. Aniban Mahapatra, ACS Publications. In 2018, ACS Publications is hosting two symposia in China as part of its Innovation Symposia Series. On July 29-31. ACS Publications, in partnership with ShanghaiTech University, will host the symposium Innovation in Materials Science in Shanghai, China. The three-day event will feature 16 world-renowned scientists from China and around the world as well as short talks from outstanding abstracts. Attendees of the ACS Publications Symposium: Innovation in Materials Science will have ample opportunities for discussion and networking at poster sessions, networking breaks, and catered meals. Check back soon for more information regarding the 2018 ACS Publications Innovation Symposia. ACS Publications’ Innovation Symposia Series brings together researchers from around the world to connect and share their scientific research advances. Each symposium offers the opportunity to present your own work to the greater scientific community, to learn from leading researchers, and to network with peers. Thank you to all participants and our partners for making the 2016 and 2017 ACS Publications Symposia a resounding success! ACS Publications hosted its inaugural event in Beijing, China on October 23-25, 2016 in partnership with the Institute of Chemistry, the Chinese Academy of Sciences (ICCAS). We welcomed approximately 500 people to the three-day event, which featured lectures on the latest innovations in the molecular sciences by 20 of the world's leading researchers. Attendees from over 15 different countries experienced ample opportunities for discussion and networking at poster sessions. At the exclusive "Meet the Speakers and Editors" event, guests learned about cutting edge research and how to get their work published from the experts. Outstanding abstracts were selected to be presented alongside top-tier researchers during the five plenary sessions. largest society for chemical professionals. Copyright ©2017 ACS Publications. All rights reserved.